Astronomy Science ~ New research states that a planet can also be formed in the star system with more than one sun, so it looks like Tatooine, the planet of the fictional Luke Skywalker in "Star Wars. Although Earth orbiting a single star, almost half of sunlike stars are in binary systems, which consist of two stars orbiting each other as a couple. Even now many found the system which is inhabited by three stars and also there are up to seven stars. Planets orbiting binary stars, like the fictional planet Tatooine from "Star Wars," is known as circumbinary planet. The first planet in real life found around two sun is Kepler-16b, the giant gas planets orbiting Kepler-16 is about 200 light years from Earth. 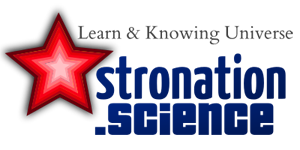 In another scenario for binary stars, planets can orbit one star but does not orbit another star. Alien planets known as planets or planetary circumprimary circumsecondary, depending on the star they orbit in a binary system - the brightest star or greater is referred to as the primary star / main stars that dim or less massive star called secondary. For example, Alpha Centauri Bb is a rocky planet orbiting Alpha Centauri B, the most dim star in a binary system Alpha Centauri AB, which is about 4.2 light years from Earth. Illustration discs of dust and gas that surrounds the double star system GG Tauri-A. The scientists think that the planet may be formed in a double star system. Planet birth of the mass of gas and dust swirling around stars. Planet formation is a slow process; one of protoplanetary discs must be for a long time before planets can form. 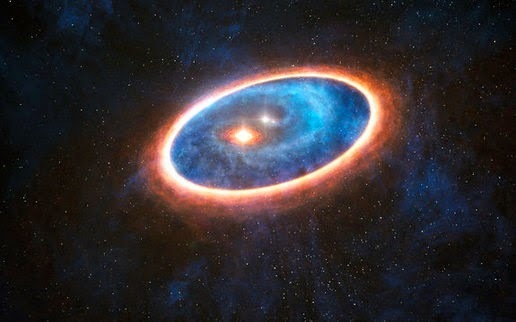 Scientists think the strong gravitational pull of binary stars will disturb the material in this disc so that the material is not easy to merge to form planets. This makes the existence of planets of binary systems in real life a little mystery. To help solve the mystery of how the planet in a binary system was born, astronomers investigate the star Tau dual system GG-A, who was only 1-5 million years. This system is located about 450 light-years from Earth, in the constellation Taurus. Scientists think GG Tau-A is a binary system of two stars (GG GG Tau and Tau-Aa-Ab). However, it turns GG Tau-Ab is also has its own binary system with another star that is very close to that, GG GG Tau-Tau-AB1 and AB2. GG GG Tau and Tau-Aa-Ab separated by about 35 astronomical units (AU) while GG GG Tau and Tau-AB1-AB2 separate about 4.5 AU. (One AU is the average distance between Earth and the sun -. About 93 million miles or 150 million kilometers). Scientists observe the gas and dust in the GG Tau-A using the Atacama Large Millimeter / submillimeter Array (ALMA) in the Atacama Desert in northern Chile. Like the other wheels within wheels, GG Tau-A disc containing a large outdoor encircling the entire system, as well as the disc around the main star, GG Tau-Aa. Circumprimary discs in having almost the same mass of Jupiter, while the outer circumbinary disc has a mass about 157 times that of Jupiter. The smaller discs have become a mystery to astronomers because the material in the disc should have gone long ago. Now, scientists have found a huge blob of carbon monoxide-rich gas in the region between two discs, which indicates that the material flows from the outer disk to disk in, creating a line that maintains both these discs. In addition, "we also suspect, from our high-resolution observations, that the young giant exoplanets may have formed on the outer edge light disc made of dust and gas, is about 250 AU from the stars in these systems," said co-author Study Emmanuel Di Folco, astronomers from the University of Bordeaux in France. Previous computer simulations have suggested that it may be outside the flow of material from the disc into the disc in a binary system, but this is the first time astronomers have actually seen this happen. "The flow of gas and dust discs around this enables the individual stars the multi system is to survive in the period long enough to eventually form planets," said Di Folco. "Our results introduce a transfer material that made possible the formation of planets around binary stars, both around the individual stars and around the binary system." Although the researchers say protoplanetary might potentially in this system, they add that this exoplanet alleged to be confirmed by future observations. "We need to investigate whether these young protoplanetary allegation that make up the gap detected in the outer disc, which will be the main evidence in the real world," said Di Folco. "Our research on a particular object will benefit from the development of the ALMA array recently have received the latest antenna. The scientists published their findings online in the journal Nature October 30.